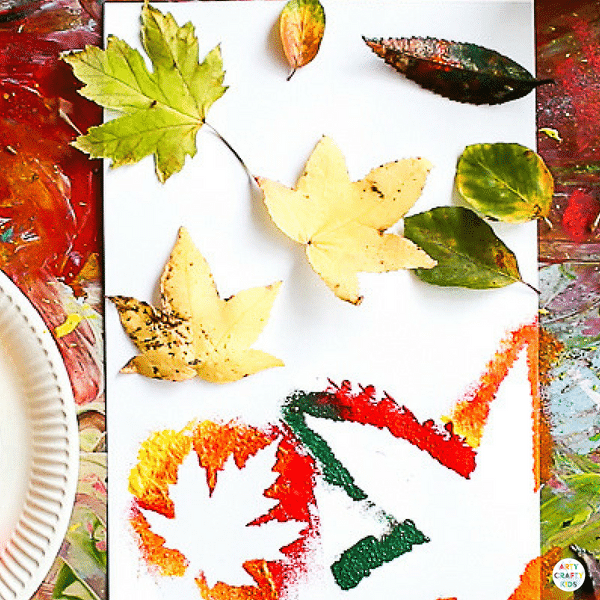 This gorgeous Autumn Leaf Painting project is an exploration of basic colour-mixing principles, with the aim to recreate the Autumn hues and shades as observed by Arty Crafty Kids. Can you make the same colour twice? Problem Solving – The process of working out ‘HOW’ to create a new colour and replicate the shades of the leaves they’ve collected is problem-solving in action. 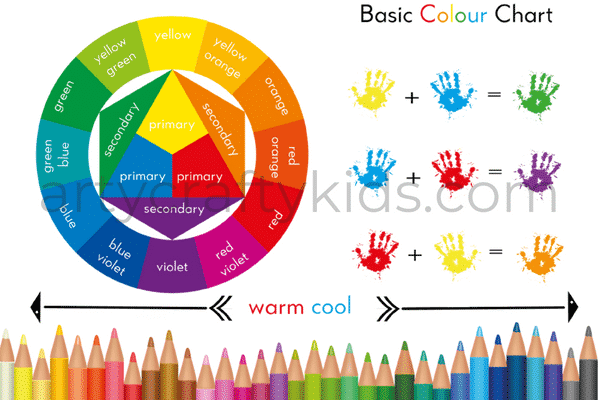 Language – Simply talking about their processes and finding appropriate words to describe their new colours helps develop vocabulary. And all of these outcomes combined stimulate and enhance children’s imaginations and creativity! This post contains affiliate links to products used within this post. Step 1. Head outside and gather as many leaves as possible. Variety is key here, so have a good rummage and find different shapes, sizes and colours! 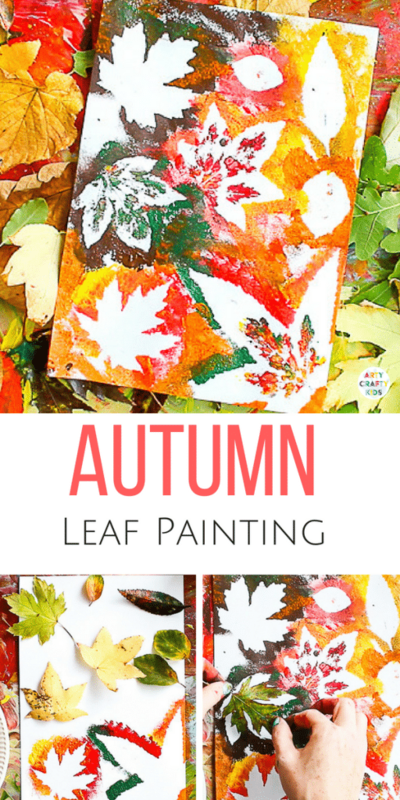 Once your Arty Crafty Kids have a bag or two filled with leaves, start painting! Using three separate plates, place one of the primary colours on each (Red, Yellow & Blue). This will allow plenty of room for colour-mixing and painting! 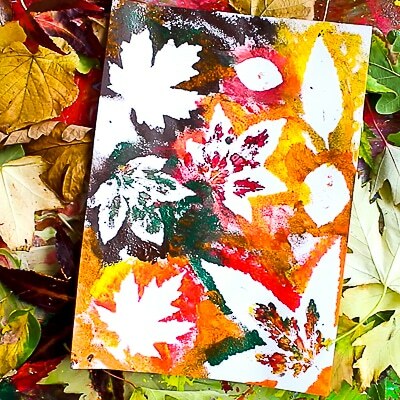 Sponge painting around the leaves may take a little practice, especially for smaller hands, but there’s no rush and the process is all about playing and exploring. Step 2. 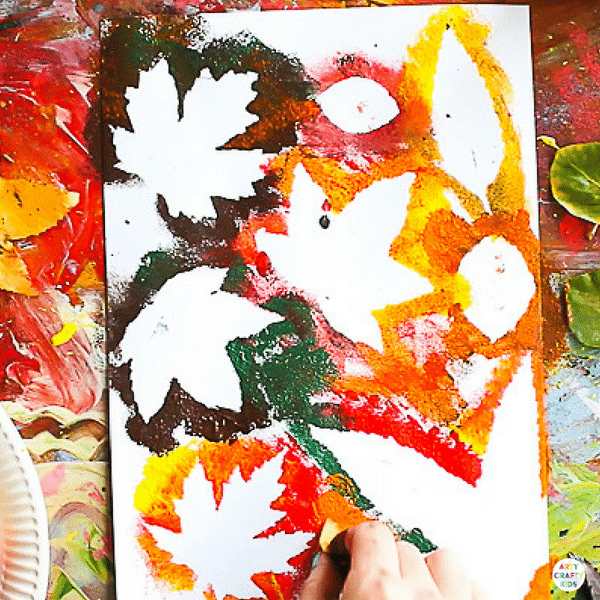 Moving on from the play to create a complete piece of leaf art is very easy to do. Position a number of leaves of different sizes and shapes on top of the canvas. 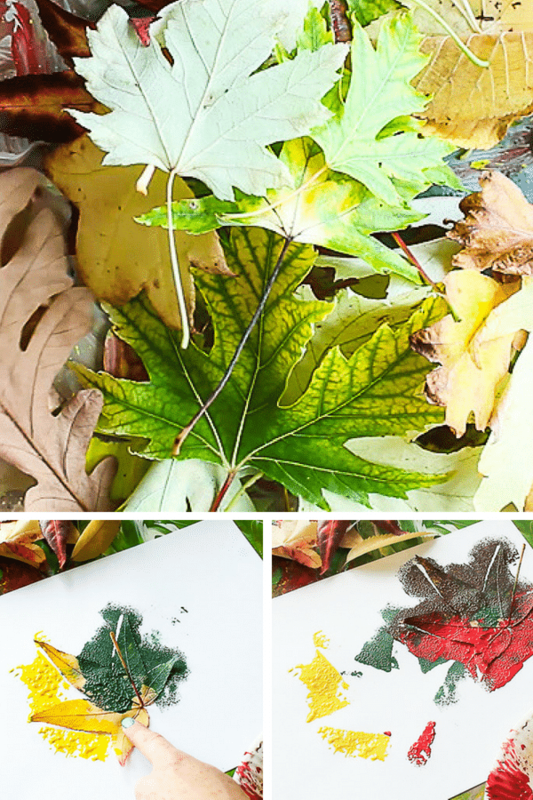 One by one, begin sponge painting around each leaf, adding different colours and tones as you work around the leaf. Once complete, gently peel the leaf away to reveal the silhouette. Step 3. Repeat the above process until the canvas is full of leafy silhouettes. 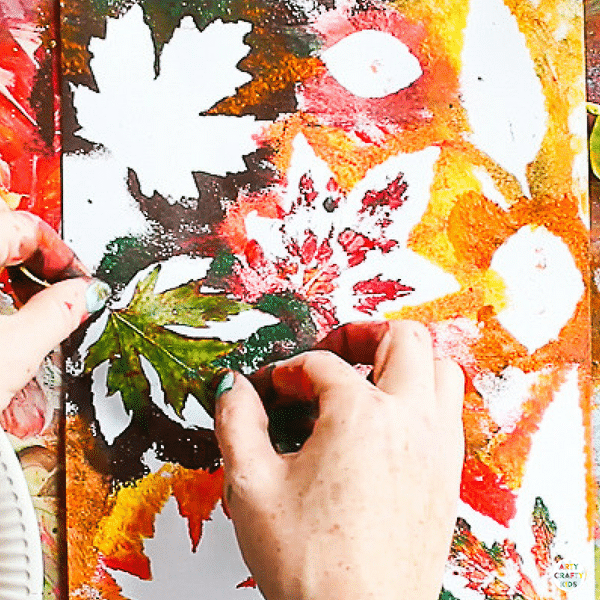 Once complete, begin filling in the remaining negative space with more Autumn colours, layering the paint to create additional depth and texture. Step 4. Next, add a leaf print within some of the silhouettes. This is a really fun way to play with negative and positive space. In art terms, negative space is the surrounding area of a point of interest. In this instance, our leaves. 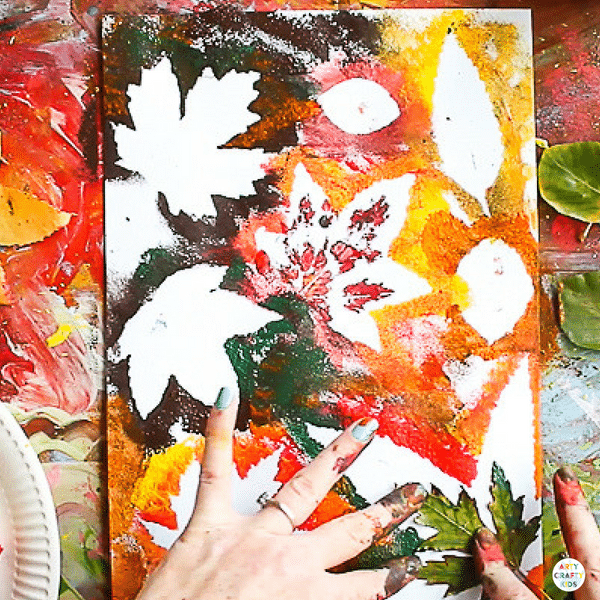 The notion of positive and negative space is naturally explored in this project and one your Arty Crafty Kids will consider without knowing the official terminology or theory – they’ll be too busy doing! For more Autumn inspired Art’s and Crafts, take a look at our Autumn Handprint Tree, Accordion Leaf Autumn Tree and Bubble Wrap Autumn Tree.